Dr. Abergel-Nahon loves being a dentist and improving patients' oral health and smiles. Over the years, the friendships that she has built with her patients and their families are sources of true joy for her, and they motivate her even more to give each patient the attention they deserve to make them feel at-home when they come to her for treatment. Dr. Abergel-Nahon's education in dentistry has provided her with a strong foundation of knowledge and experience. 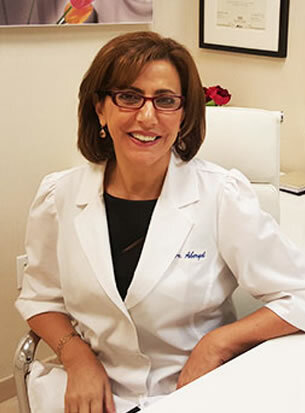 She received her Doctorate of Dental Society from New York University in 1985, her general practice residency at the Metropolitan Hospital in New York, and her fellowship in treatment of the disabled at Long Island Jewish Hospital. By regularly participating in continuing education, Dr. Abergel-Nahon is able to stay current on the latest technology and orthodontic treatments. Her patients deserve the best, and continuing education allows her to provide them with more options and better results. She is a member of several professional associations that provide her with opportunities for continuing education. Dr. Abergel-Nahon feels truly blessed to live and work in such a wonderful community. She enjoys getting to know her patients and their families, and it is always an honor to know that she has made a difference in so many of her patients' lives. She couldn't ask for a better job or for better people sharing their smiles with her and she looks forward to working with you.